I am currently engaged in ongoing research with Dr Stephen Cushion looking at television news coverage of second order elections. Our 2013 data includes many items reporting the death of Margaret Thatcher and the subsequent evaluations of her legacy. It will be news to no- one that she polarises opinion in death as in life. Perhaps the most eloquent (and damning) of political opinions was offered by the equally controversial George Galloway on the BBC’s Daily Politics show. Galloway condemned the nation’s public service broadcaster for leading what he felt was a collective outpouring of misplaced grief. A state funeral he claimed, amounted to “the canonisation of the wicked woman who laid waste to industrial Britain”. The country was “being forced” to listen to a “tidal wave of guff, particularly on the BBC”. 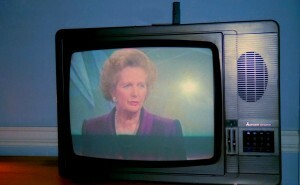 When his interviewer proposed that in death, Mrs Thatcher was only being officially recognised like other long-serving leaders, Galloway dismissed it, proclaiming that “Winston Churchill saved the very existence of this country while Mrs Thatcher did her best to destroy everything that was good about it”. Then, to suggestions that it may be premature to voice such strong opinions, he asked why we must “observe this fake silence about the record of a woman who caused such wreckage in this country”. Finally, in response to accusations of impoliteness, he embellished his case by using the political orator’s favourite rhetorical tool, Max Atkinson’s “three part list”. “Was Mrs Thatcher polite about the miners when she destroyed their communities leaving them social slag heaps of needles and crime, vice and idleness” he implored, “was she polite to the steelworkers when she destroyed them, or to the print workers when she destroyed them?” His final sound bite summarised the collective sentiment of the hard left. “Spare me this sanctimony about politeness please” he admonished, ”there are millions in the country who hate the very word “Thatcher” and the “Thatcherism” which continues to this day”. Galloway managed, manipulated and mastered this interview, and with not an “um” or “ah” in the whole monologue, it was as eloquent as it was uncompromising. It forced me into quiet reflection about what Margaret Thatcher had meant to me. My conclusion was that my relationship with her had been evolutionary, and interestingly, until that moment in a research office with headphones on and code sheet at hand, it was a relationship developed almost irrespective of her media representation. Mrs Thatcher had been Prime Minster for 8 months when I left school before taking ‘A’ level exams in December 1979. I got a job, and with money in my pocket took delight in watching my friends taking the exams I had dodged. Our working days were different, but our collective teenage angst was united in loathing Margaret Thatcher. Punk rock was the tangible platform for rebellion and we embraced its every element. Politically naïve, I was unsure why I really disliked her, but it was fashionable and a consolidating force for friendships I was keen to develop. In one of those delicious ironies you could never invent, the friend with the inside track on the depth of Thatcher’s evil went on to forge a career in merchant banking. We all grew up, and some rebelled longer than others. During her political reign, I bought my first house, my career accelerated at a rate not repeated since, and my relative wealth was higher than at any time in my life. Mrs Thatcher had established an economic system that had enabled me to thrive. I wasn’t outwardly grateful and never thawed enough to vote Conservative, but antipathy turned to apathy. When she became an (arguably) peripheral figure in British politics after 1990, I almost forgot about her altogether until the research project in late summer 2013 when I watched the reaction to her death. For my PhD, I have been researching UK income distribution ahead of empirically examining how this is presented in TV news broadcasts. It seems almost unchallengeable that after a period of relative stability and/or reduction during the 1960s and 70s, income inequality accelerated sharply during the political reign of Mrs Thatcher. Scholars like Jenkins suggest blaming her alone for increasing income disparity is too simplistic since the gap began widening before her political reign. The huge weight of scholarship however, concurs that the upward trend really hardened during her term in office when regulatory frameworks were dismantled. Under her supervision for example, the trade unions, who protected the low-paid and kept “fat cat” salaries in check were neutered. The growing economic disparity seems inevitable against a backdrop where she famously claimed “there is no society”. It was the ultimate encouragement for economic self-interest where people put themselves first. In 1979, she disbanded The Royal Commission on the Distribution of Income and Wealth, so now the advance towards individualism could evade the radar. In The Guardian, John Harris reminded us of how Harry Enfield’s comic creation of self-made plasterer “Loadsamoney” bragged about his “wad” of cash, exemplified by one critic as “Thatcherism’s shameless Golem”. To emphasise the developing inequality Enfield developed a parallel character called “Buggerallmoney” who had no “wad”, but whose lifestyle embraced alcoholism, violence and dysfunctional families. There may have been more than a grain of truth amid the laughter. The problem with income inequality according to notable research by Wilkinson and Pickett amongst others is that it is accompanied by worrying trends in things like health, literacy, life expectancy, violent crime and mental illness. Even if you find this unconvincing, on a more superficial level most may agree that something that pushes people apart is not as good as something that brings them together. Moreover, while everyone is looking after themselves, who looks after those that can’t? And when winner-takes-all, doesn’t that mean there are just more losers? My relationship with, and opinion of Mrs Thatcher changed and changed again due to a shapeless and unintentional mixture of peer pressure, personal experience and academic papers. It is uncomfortable to admit but my days of milk and honey happened on her watch. In my unease, I retreat to the scholarly evidence which answers the question I should have asked all along “Hey folks, remind me again why we don’t like Margaret Thatcher?” Sorry Mrs T – fickle as I am, from my current reading, it seems unlikely that my feelings for you will change again. The media hasn’t hardened my resolve, but it did start me thinking. Agenda-setting works, I guess. ← Sections of the tabloid press encourage us to hate, envy and fear. This matters.